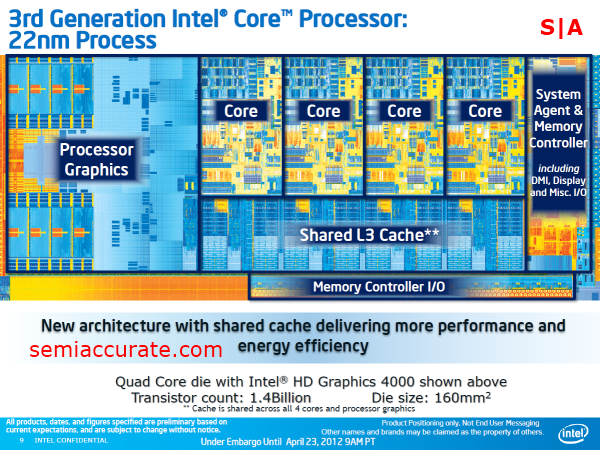 It’s that time of year again and Intel’s introducing its new Ivy Bridge based offerings. We’ve already looked at the GPU side of Ivy Bridge in our two part review of the HD 4000 and now we’re switching over to the CPU side for a closer look. 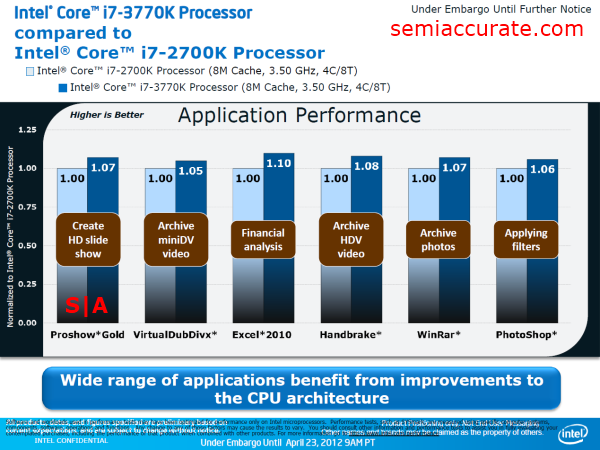 We’ve selected a few slides from the pile that Intel sent us to illustrate what consumers should expect from Intel’s new Ivy Bridge line-up. First of all Ivy Bridge is fast. We’ve been running benchmarks on our review sample for the better part of the last month, and I have yet to be anything other than impressed by the level of performance that the Core i7-3770K (our review sample) brings to the table. As you can see from these SYSmark scores, an equally clocked Ivy Bridge chip has a bit of an edge over last year’s Sandy Bridge. Now here at S|A we don’t actually put any stock in SYSmark scores due to this little schism from last year. But we can see that at least in one heavily CPU reliant benchmark suite Ivy Bridge can offer at 3 to 9 percent performance bump over Sandy Bridge. 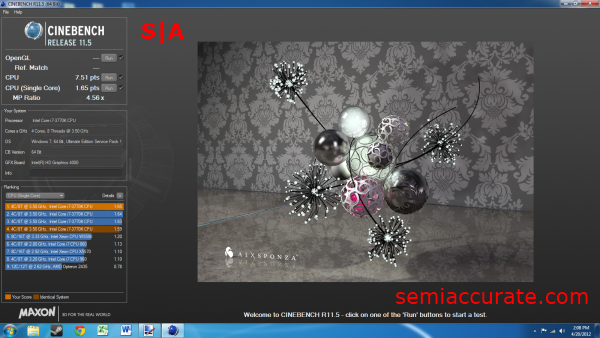 Moving on to the Cinebench and PovRay scores we can see once again that Ivy Bridge is just a bit faster than Sandy Bridge. The improvement ranges from 6 to 10 percent increase in performance in these two rendering applications. Looking at a wider array of real world applications we can see that the small bump in performance continues to be felt pretty much across the board. The Handbrake numbers are particularly interesting to us, as that is one of the applications we’ll be testing with today. Again what we’re seeing here is a 6 to 10 percent increase in performance. Above we have another slide that shows a 4 to 10 percent improvement in performance. 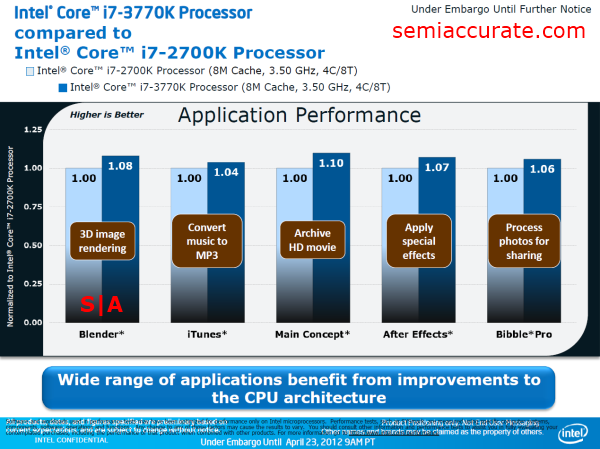 So basically Intel’s slides confirm what’s been rumored around the web for quite some time, Ivy Bridge offers only a modest improvement in terms of CPU performance over Sandy Bridge. With that in mind we decided to try and get as close to a clock for clock comparison as we could manage between our Ivy Bridge and Sandy Bridge samples. As we’ve mentioned in earlier reviews Intel sent us a Core i7-3770K and a Core i5-2500. So how are we going to try to use these two CPUs for a comparison? 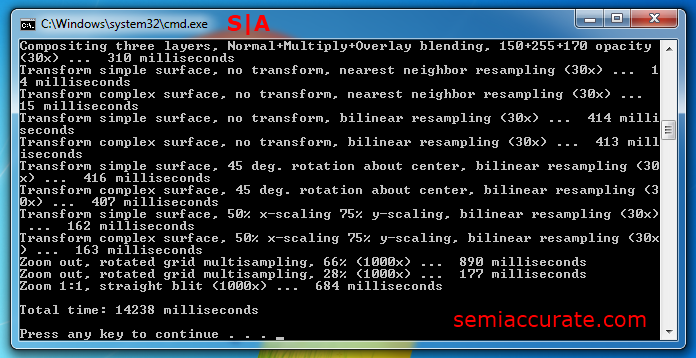 Well, were going to try and remove as many variables as possible from the performance equation. This means setting each CPU at the 3770K’s 3.5Ghz stock clock speed, disabling turbo boost, and disabling hyper transport on the 3770K as the 2500 doesn’t support it. At these settings all we’ll be dealing with is just two CPUs at 3.5Ghz; or at least we would be if the 2500 didn’t come with only 6 MBs of its L3 cache enabled. This is the one major flaw in our comparison, the difference in cache sizes. But there’s not really anything we can do about it, so just keep in mind that our Sandy Bridge based CPU would probably gain a percentage point or two in heavily threaded applications if it had those extra 2 MB of cache. At the same time though, the missing cache shouldn’t affect our results to the point where our conclusions are misleading. Actually, the comparison between a stock 3770K and our slightly overclocked 2500 may be more relevant to many of you due to the popularity of the 2500, and the 2500K, as the CPUs of choice for value conscious gamers. With that in mind let’s take a look at our first of six benchmarks, Cinebench R11.5. Cinebench has been around for quite sometime now and is a generally well respected rendering benchmark that tends to illustrate the advantages of CPUs will high levels of parallelism. So let’s look at our first round in this Sandy Bridge versus Ivy Bridge bout. It appears that Ivy Bridge is about five or so percent faster than Sandy, clock for clock. If we compare our scores to Intel’s we can see that they are in-line, or just slightly behind Intel’s own findings of a six percent Ivy Bridge advantage in single-threaded testing and a seven percent advantage in multi-threaded testing. So far everything seems to be in the right ball park. Next up we have our wPrime slug fest. wPrime is a benchmark designed to scale perfectly across increasing numbers of threads, and it calculates large numbers of square roots in an attempt to fully stress your CPU cores. 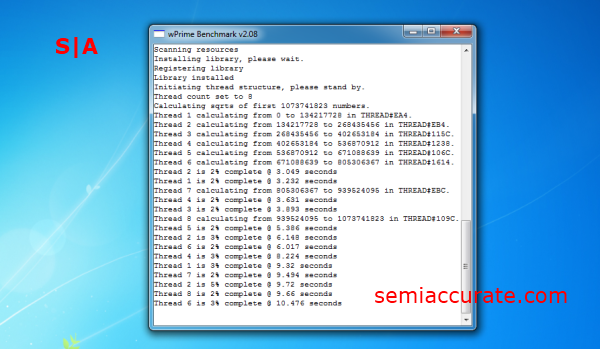 The gap is smaller in wPrime than it was in Cinebench, but Ivy still maintains a slight edge over Sandy. Although, if we look purely at their execution times the performance differences between the two is a wash considering the two to three percent margin of error inherent to benchmarking. 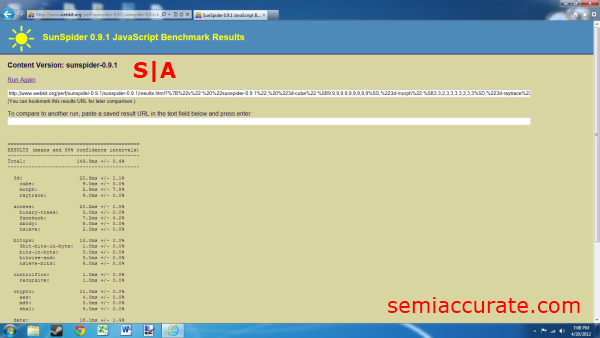 As web based Java script benchmarks go Sun Spider is probably the most well known. Now this isn’t the perfect benchmark for comparing CPU performance, especially in light of how greatly its performance can vary based on the browser you’re using, and the light (think 14 percent) load it puts on a quad-core CPU, but can tell us a little bit about the impact of CPU performance on web-based applications. Does Ivy’s small increase in performance result in any gains in this benchmark? As it turns out the answer is a resounding yes. An eleven percent gain is the highest we’ve seen so far in this review, so obviously Ivy offers a performance advantage over Sandy in light work loads. Now one could argue that this benchmark might be small enough to fit inside Ivy’s 8 MB L3 cache, and that 2 MB gap is cache sizes may be contributing to the performance disparity in this benchmark. Fair enough, but even if we dock Ivy bridge two or three percentage point we still have clear proof that Ivy offers quantifiably more performance than Sandy in this benchmark. We’re using a benchmark for the now older 3.2 version of Paint.NET to asses Ivy’s advantage in image manipulation applications. Look at those command-line functions! 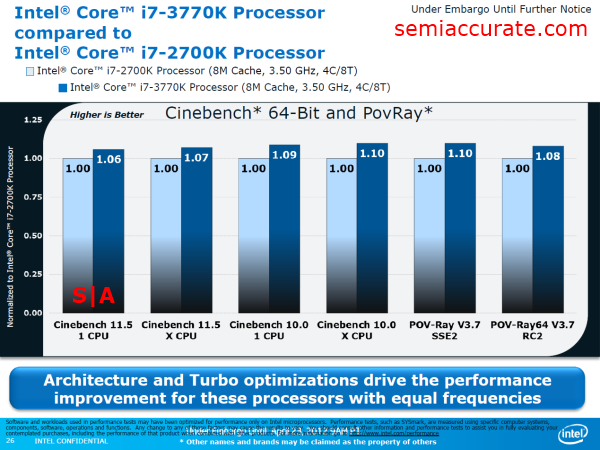 We have yet another small, in this case six percent, Ivy Bridge performance advantage. A popular archiving application, 7-zip, is also multi-threaded and good for showing off the prowess of CPU cores, provided its operations aren’t bottle-necked by your storage speeds. For this test we archived a copy of a “House” episode to a .zip file using the Ultra compression method, and then we encrypted the file with 7-zip’s AES-256 option. Yet again Ivy Bridge turns out to be just a little bit faster than Sandy. At this point Intel’s slides showing an increase in performance of between four and ten percent are right on the money. 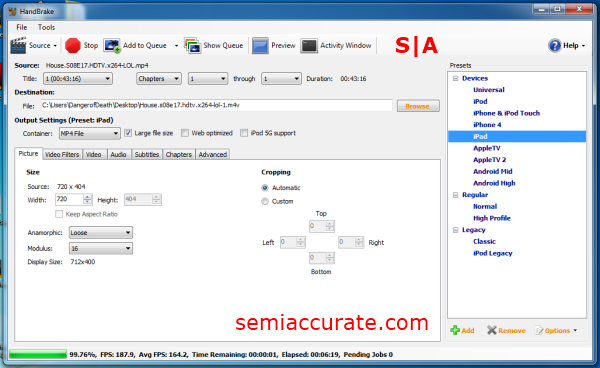 A video conversion application, Handbrake is a useful benchmark for people that like watching videos to port them their mobile devices. For our testing we converted the same “House” episode we used in 7-zip to Handbrake’s iPad preset. 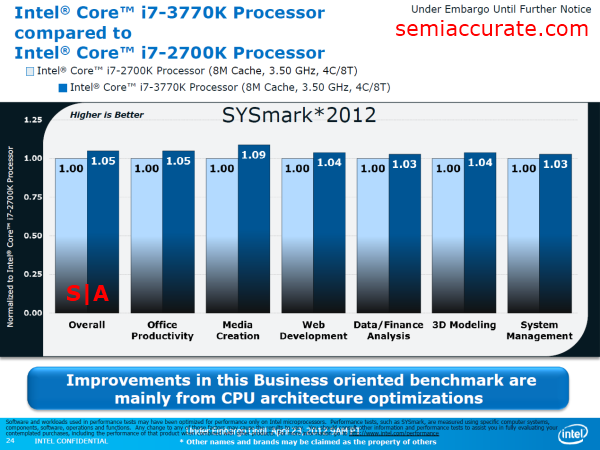 A five percent advantage is what Ivy Bridge is able to muster in this benchmark. Let’s tally everything up and see where we’re at. We did not run Ivy Bridge through a single benchmark in our suite where it came out slower than Sandy Bridge. At the same time though, the highest clock for clock advantage we found was eleven percent, in a rather light-weight app. So when we average everything out it’s unsurprising to find that clock for clock Ivy Bridge offers a five percent advantage over Sandy Bridge, when you have Turbo Boost disabled, and Hyper-Threading off. Now some of you might be a little displeased with this small up tick in performance, but its important to remember what Intel was aiming for when they were designing Ivy Bridge. Improved GPU performance, better quick sync performance, and a slightly massaged CPU core. Additionally, Intel has chosen to forgo most of the extra transistor budget that its 22nm process shrink has brought it, and instead opted to use a smaller die size which should improve Intel’s bottom line. In a larger sense its really amazing how much performance Intel has managed to cram into a die that’s only 160mm2, instead of the ~230mm2 that we are accustomed to seeing for mainstream products.